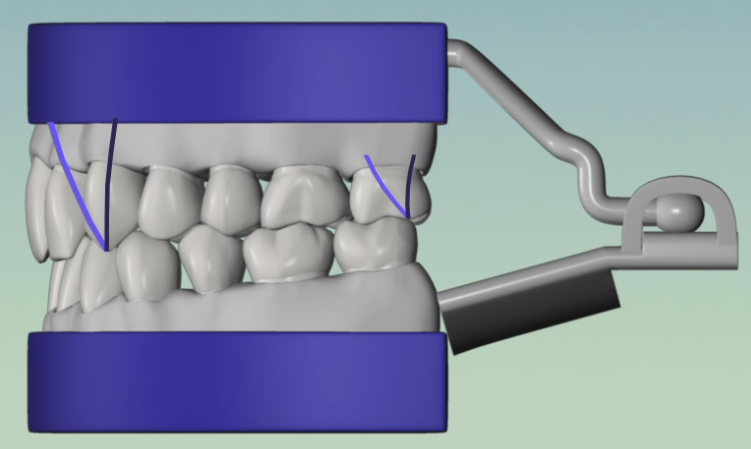 For a long time we've thought it would be good to show why a full function articulator is a necessary piece of equipment and this month, with help from Panadent, we have two animations that will help you further distinguish yourself from other dentists. We are also issuing another software update as we have updated the software in the installer you download as a new customer or if you download the latest from the Members Area. Details of why we have done this are given below. 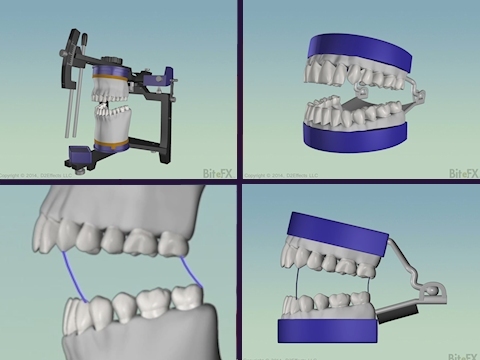 Two animations showing the function of the articulator. The first is for explaining how an articulator works. The second extends that animation to compare a full articulator with a simple hinge articulator. If you use a face bow to determine the position of the condylar axis, or if you take impressions of your patients' teeth so that you can study their bite before making changes in their mouth, you may well be doing things your patients have never experienced from another dentist. In the first of this month's animations we give you a tool to explain why you are taking those records and how you will use them. 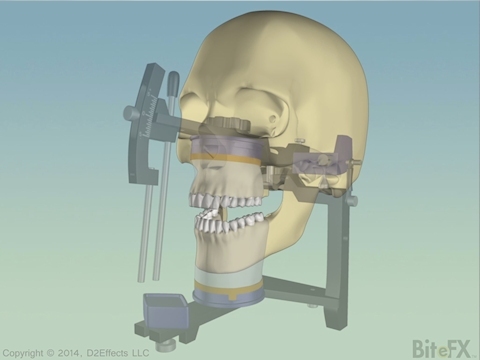 The animation shows the jaw moving relative to the skull, then changes to hold the jaw stationary and move the skull - emulating the motion in the articulator. The articulator is faded in, as shown above, to show that the articulator accurately mimics the motion of the jaw. Finally the skull is faded out to show the articulator working on its own. The second of this month's update animations includes all of the first animation but extends it by adding the motion of a simple hinge articulator. The animation shows both full and hinge articulators working in a side view, and draws the arcs followed by front and back teeth in each. This is an excellent tool for helping patients understand why you are different from the average dentist and why your treatment recommendations work well for your patients. Thank you Tom Lee, President of Panadent, for help in creating the animation models of the articulator and to Dr. Milos Boskovic for reviewing the animations and suggesting suitable enhancements. We have put these two animations in a new group called "Diagnostics" and moved the Leaf Gauge animation to this group. The "Leaf Guage + Equilibration" animation stays in the "Treatments" animation group. Some of the fixes we issued last month in BiteFX software version 2.0.3.32 avoid problems that some people were encountering when installing BiteFX. We therefore decided to create a new installer file (the .msi file that you download to install BiteFX). That takes a little longer to build and test so by the time we were ready to make the update we had found and fixed a few other minor issues. We have therefore updated our installer with BiteFX version 2.0.3.38 so are issuing BiteFX 2.0.3.38 as Update 28 this month. That way whether you use the new installer (followed by updates) or started with one of the previous installers and applied all the updates, you will end up with the same software, animations and photos. If an updated animation was in a user-defined sequence, the sequence name was highlighted, but not the animation. Unplayed, updated animations are now highlighted in user-defined sequences as well as in the fixed area of the animation selection panel. If a user-defined sequence contained a character that was invalid for a file name (e.g. / \ : ? * < > = | ) and you tried to export the sequence, nothing would happen and you wouldn't know why. BiteFX will now remove the invalid characters from the suggested filename so that the export can proceed successfully. When using Autoplay, previously set speeds for an animation were lost. They are now preserved. Using the scroll wheel when an empty Updates dialog was displayed could cause BiteFX to close. This has been fixed. Update will no longer apply out-of-date updates. If, for example, you use the 2.0.3.38 installer, the update mechanism knows not to apply updates that would install earlier versions of the software. Note: The 2.0.3.38 installer is NOT a roll-up build. It uses the latest version of the software but, after installing, updates 17 and following still need to be downloaded and installed to bring BiteFX fully up-to-date. We are working on some enhancements to be released in a few months' time and at that point we will produce a "roll-up" build that includes all the updates issued to that point.